It’s not every day that you get to meet an intelligence specialist, an electrician, a recruiter, and a K9 unit all on the same day. 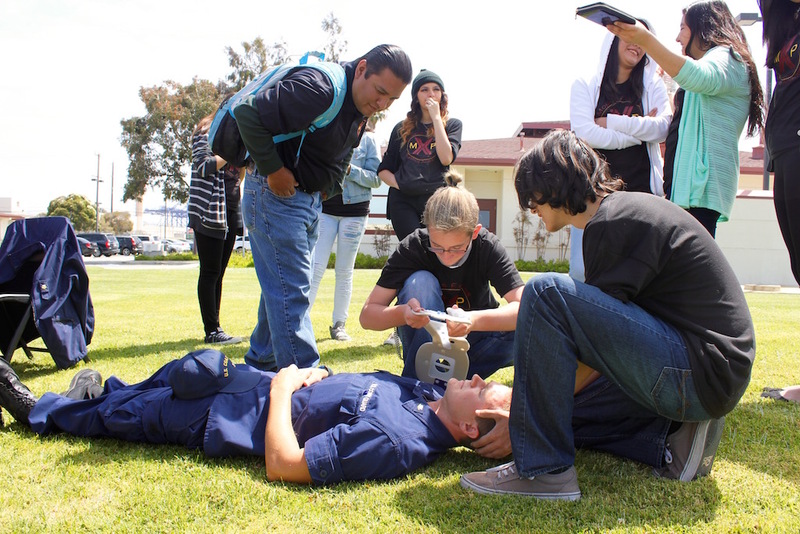 However, that’s exactly what ITEP students were able to do during ITEP’s Day of Discovery at the U.S. Coast Guard Base, Los Angeles-Long Beach. 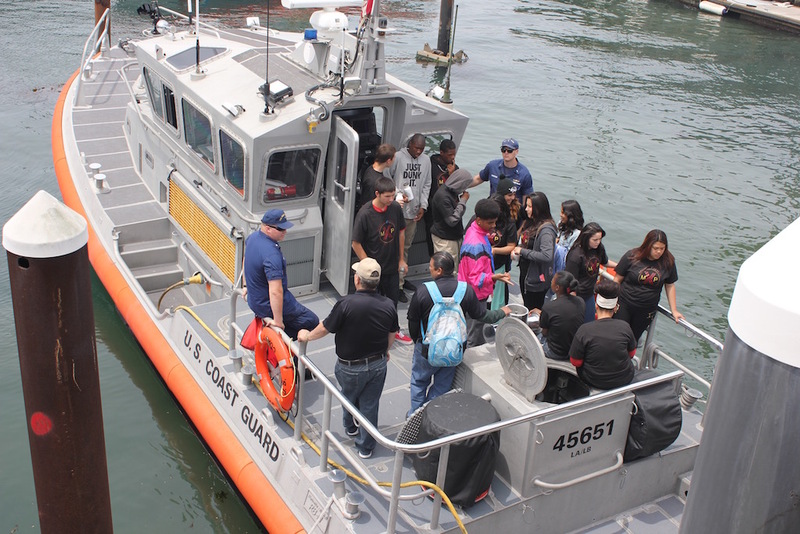 Students from Barstow, Juan Rodriguez Cabrillo, and Phineas Banning High Schools spent the day in San Pedro to explore careers offered by the U.S. Coast Guard. 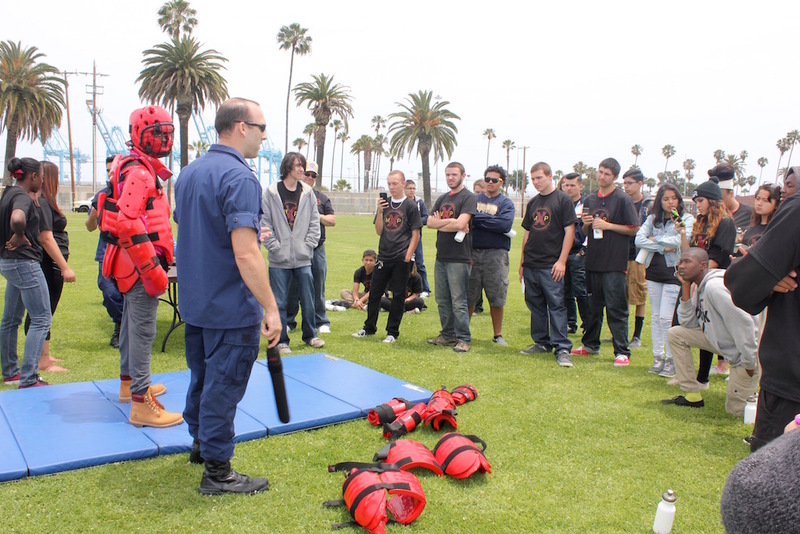 ITEP students visited stations throughout the base to explore U.S. Coast Guard careers. 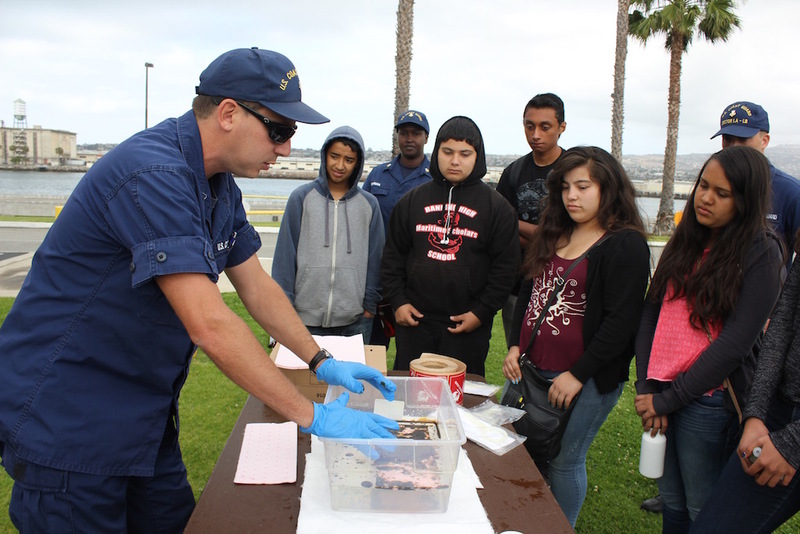 At this station, students received a demo on the Coast Guard’s role in handling oil spills. Check out more photos from our recent Day of the Discovery here and don’t forget to LIKE our Facebook Page! 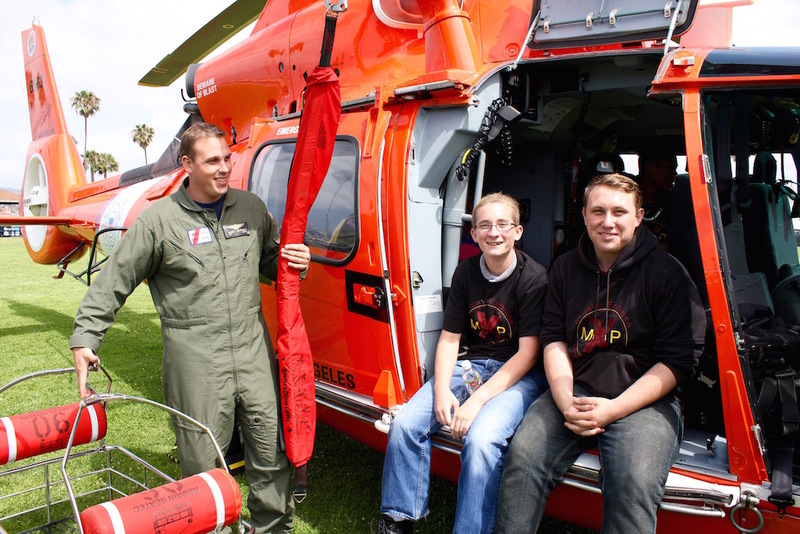 In collaboration with the Coast Guard’s Partnership in Education (PIE) Program and thanks to the great support from PIE Coordinator LTJG Kristen Bradley, ITEP students began their field trip by watching a Coast Guard “helo” (helicopter) land on the base. After receiving a very warm welcome from the Sector Commander and Captain of the Port Jennifer Williams, students then explored stations throughout the base to learn about search and rescue, emergency response, law enforcement, medical services, navigation, and the branch’s K9 unit. ITEP students were also introduced to Coast Guard Officer Programs available to college students. Our great Coastie plays the role of an injured patient while ITEP students work together to place a neck brace on him. ITEP students explore the U.S. Coast Guard Boat Station to learn about search and rescue and navigation. At this particular station, ITEP students learn about law enforcement and security practices within the U.S. Coast Guard. “I learned a lot about the Coast Guard… You have a lot of opportunities available for you. There’s a little bit more freedom than any other branches… I really, really like this place,” he added. Cristian is a current ITEP Junior from Barstow High School’s Mojave Express Logistics Academy (MXP). We thank our Coasties for showing ITEP students that there are men and women in uniform who care about their futures and the endless careers that wait for them at a berth and beyond.